The Boston Red Sox today selected left-handed pitcher Dustin Richardson to the active Major League roster from Triple-A Pawtucket. Richardson, wearing No. 54, will be active for tonight’s game against Toronto at Fenway Park. To make room on the club’s 40-man roster, outfielder Chris Carter was designated for assignment. For Richardson, 25, it is his first career Major League stint. This season, he combined to go 2-2 with four saves and a 2.55 ERA (21 ER/74.0 IP) over 45 relief appearances between Double-A Portland and Triple-A Pawtucket. He compiled a 2.70 ERA (19 ER/63.1 IP) in 38 games with Portland, earning Eastern League All-Star honors and holding opponents to a Double-A-best .186 average (42-for-226). Promoted to Pawtucket on August 21, the left-hander recorded a 1.69 ERA (2 ER/10.2 IP) and 16 strikeouts in seven games with the PawSox. 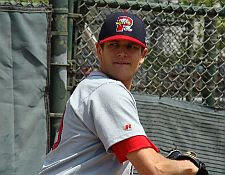 Selected by Boston in the fifth round of the 2006 First-Year Player Draft, Richardson has compiled a 22-21 record with 6 saves and a 4.11 ERA (159 ER/348.0 IP) in 110 games (50 starts) over four seasons in the Red Sox organization, combining for 381 strikeouts compared to 160 walks. In his only stint with the Red Sox this season, Carter was hitless in five at-bats and drove in one run over four games from April 13-20. The 27-year-old outfielder combined to hit .261 (6-for-23) for Boston over 13 games from 2008-09, his only Major League experience. In 116 games with Pawtucket this year, he hit .294 (126-for-428) with 16 home runs and 61 RBI. With today’s move, Boston’s active Major League roster is at 36 players.